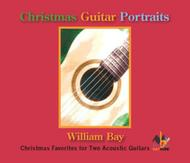 Christmas Favorites for Two Acoustic Guitars. Composed by William Bay. Holiday: Christmas, Duets and Ensemble, Duets and Ensembles, CD. Style. Compact disc. Mel Bay Publications, Inc #WBM01CD. Published by Mel Bay Publications, Inc (MB.WBM01CD). The Christmas season has always been special to me. It is a season that has crystalized the hopes, aspirations and faith of millions of people through the centuries. The amount of music written for Christmas is monumental. For this recording I selected various genres dear to me. First, there are selections from the early American sacred song tradition. The Babe of Bethlehem, Cherry Tree Carol, A Star in the East, The Shepherd's Star, A Virgin Unspotted and I Wonder As I Wander* all are from this rich heritage. I also picked a number of carols from the Old English genre. Away In The Manger, Green Grow'th the Holly and What Child is This are included. Then there are the Christmas favorites. In the Bleak Mid-winter and a medley of Baloo, Lammy; The First Noel and Silent Night make any Christmas complete. Let All Mortal Flesh Keep Silence is one of my favorite Advent hymns. Gaudete, Christus est natus is a rousing carol dating back many centuries. Finally, I included two originals. Lullay, My Liking is an ancient carol text. Many composers over the centuries have written melodies to these lyrics, most notably Gustav Holst. I could not resist the temptation so the melody here is original. Finally, Christmas Prayer is a new composition written for this recording.